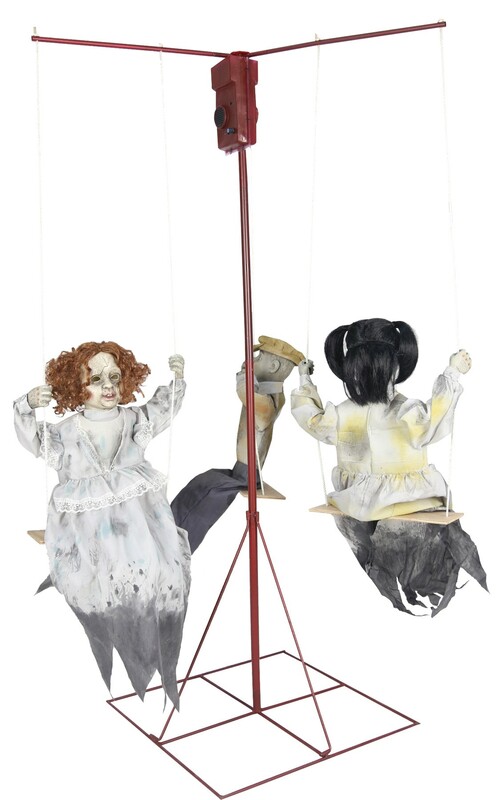 What is more chilling than three forgotten dolls from yesteryear slowly riding a merry-go-round for an eternity? This eerie prop is the perfect way to turn your home into a haunted mansion or haunted playroom. Creepy music plays at the merry-go-round goes round and round. 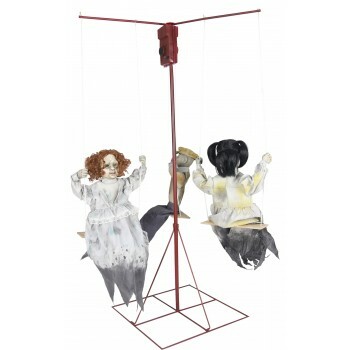 Prop includes red iron frame merry-go-round with three swings, and three dolls dressed in distressed Victorian era clothing with cracked faces. Add this animated prop to your indoor Halloween decorations to leave a haunting impression. Animations/sound effects: eerie music with volume control, merry-go-round spins around. Activation options: steady-on, infra-red sensor (works up to 6.5 feet away & works in all lighting conditions), step-here pad (included). Power: UL power adapter that plugs into any standard outlet. Materials: iron, PVC, polyester, and cotton. Assembly required.